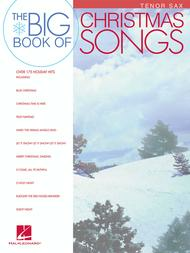 Big Book of Christmas Songs for Tenor Sax composed by Various. For Tenor Saxophone. Instrumental Folio. Christmas. Instrumental solo book. 144 pages. Published by Hal Leonard (HL.842145).ISBN 1423413695. Christmas. 9x12 inches.An awesome collection of all the best Christmas songs, traditional and contemporary, including: All I Want for Christmas Is You * Angels We Have Heard on High * Auld Lang Syne * Away in a Manger * Blue Christmas * The Chipmunk Song * The Christmas Song (Chestnuts Roasting on an Open Fire) * Christmas Time Is Here * Do They Know It's Christmas? * Feliz Navidad * Frosty the Snow Man * Grandma Got Run over by a Reindeer * I've Got My Love to Keep Me Warm * Last Christmas * Let's Have an Old Fashioned Christmas * Mele Kalikimaka * Miss You Most at Christmas Time * The Most Wonderful Time of the Year * My Favorite Things * Nuttin' for Christmas * Pretty Paper * Santa Baby * Silent Night * Wonderful Christmastime * and more!